The stunning popularity of the “New Atheist” movement—whose most famous spokesmen include Richard Dawkins, Sam Harris, and the late Christopher Hitchens—speaks to both the growing ranks of atheists and the widespread, vehement disdain for religion among many of them. In Faitheist, Chris Stedman tells his own story to challenge the orthodoxies of this movement and make a passionate argument that atheists should engage religious diversity respectfully. Becoming aware of injustice, and craving community, Stedman became a “born-again” Christian in late childhood. The idea of a community bound by God’s love—a love that was undeserved, unending, and guaranteed—captivated him. It was, he writes, a place to belong and a framework for making sense of suffering. But Stedman’s religious community did not embody this idea of God’s love: they were staunchly homophobic at a time when he was slowly coming to realize that he was gay. The great suffering this caused him might have turned Stedman into a life-long New Atheist. But over time he came to know more open-minded Christians, and his interest in service work brought him into contact with people from a wide variety of religious backgrounds. His own religious beliefs might have fallen away, but his desire to change the world for the better remained. Disdain and hostility toward religion was holding him back from engaging in meaningful work with people of faith. And it was keeping him from full relationships with them—the kinds of relationships that break down intolerance and improve the world. In Faitheist, Stedman draws on his work organizing interfaith and secular communities, his academic study of religion, and his own experiences to argue for the necessity of bridging the growing chasm between atheists and the religious. As someone who has stood on both sides of the divide, Stedman is uniquely positioned to present a way for atheists and the religious to find common ground and work together to make this world—the one world we can all agree on—a better place. 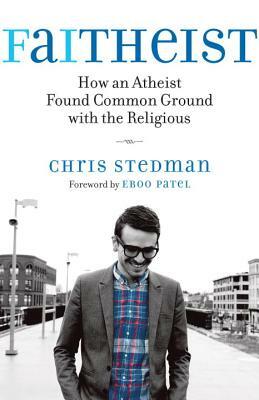 Chris Stedman is the Assistant Humanist Chaplain at Harvard University, the emeritus managing director of State of Formation at the Journal of Inter-Religious Dialogue, and the founder of the first blog dedicated to exploring atheist-interfaith engagement, NonProphet Status. Stedman writes for the Huffington Post, the Washington Post’s On Faith blog, and Religion Dispatches. He lives in Boston. “Christians like me have heard lots of ‘testimonies’—how I once was lost but now am found, was blind ... and so on. We've heard how atheists converted to Christianity, how backsliders came back to piety, and how heretics returned to orthodoxy. What we haven’t heard enough of is testimonies about how a Christian became an atheist or how an atheist became a faitheist or how a gay Evangelical came out of the closet and out of the church. I’ve never read, heard, or met anyone better suited to this task than Chris Stedman. His beautiful writing voice, his poignant story-telling skill, his clear-eyed insight, his humane and humble empathy uniquely equip him to bear witness to everyone—especially Christians like me. Rigid anti-theists and theists alike will be challenged as they read—challenged to greater humanity, empathy, and understanding. Wholeheartedly recommended.”—Brian D. McLaren, author of Why Did Jesus, Moses, the Buddha, and Mohammed Cross the Road? "His book about being religious and being secular, together, offers his hope for a better world"